Alfa Romeo claims its new SUV will eclipse all rivals on performance in 503bhp Quadrifoglio guise, on sale early next year, priced from around $40k. 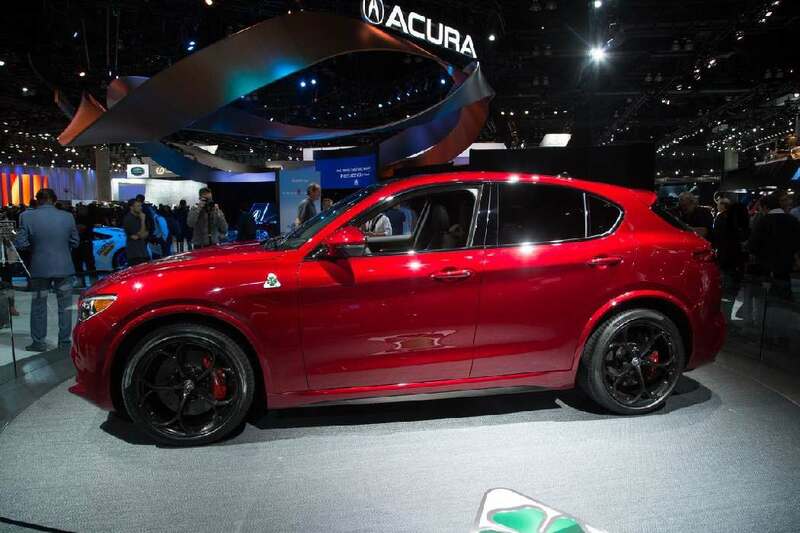 Alfa Romeo’s new four-wheel-drive Stelvio Quadrifoglio, unveiled at the Los Angeles motor show last week, stands to be the fastest SUV yet built, its makers claim. The 503bhp Stelvio Quadrifoglio packs an impressive 65bhp more than the most powerful Porsche Macan, can accelerate from 0-60mph in just 3.9sec and is predicted to lap the Nurburgring in less than eight minutes. The hot new SUV uses much of the running gear of the potent twin-turbo 2.9-litre V6 Giulia Quadrifoglio saloon shown in Frankfurt last year and it sits on the same unique to-Alfa Giorgio platform. The Stelvio Quadrifoglio sits above a range of three equipment levels and a line-up in Europe that will include 2.0 petrol and 2.2 diesel engines and a rear-wheel drive option. Made in Alfa Romeo’s recently refitted Cassino factory, the model is expected to be on sale in Europe in the first quarter of next year and in the US by the middle of the year. However, it won’t be available in right-hand drive until the third quarter of 2017, probably as the diesel version that Alfa expects to be the biggest seller in Europe. Following this, the Stelvio Quadrifoglio will arrive with an all-aluminum, twin-turbo 2.9-litre V6 petrol engine, shared with the Giulia Quadrifoglio and producing 503bhp and 443lb ft. 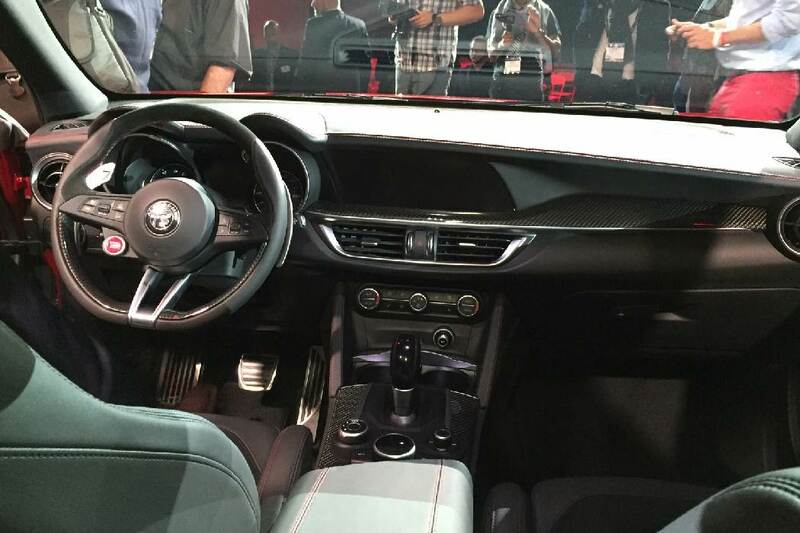 Unlike the Giulia, though, the hot Stelvio will be offered with four-wheel drive only, with Alfa Romeo’s Q4 system - which sends 100% of the torque rearwards in normal conditions but can divide it between the front and rear by up to 50/50 coupled with torque vectoring for the first time. Alfa Romeo boss Reid Bigland confirmed that the Stelvio will also come in a rear-driven, lower-power form. He claimed the car is light for its class in that guise and also hinted that a new 207bhp diesel engine, first used in the Giulia Veloce, would feature in this Stelvio variant. Bigland has predicted that the car will lap the Nurburgring in less than eight minutes. A Porsche Panamera Turbo has been recorded lapping the track in 7min 56sec. “The Stelvio is uniquely engineered to challenge two-door cars on the track without compromising the SUV side of its character,” said Bigland. “We have leveraged Ferrari to help deliver class-leading power and it will also come with Alfa Romeo’s Q4 all-wheel drive system. The Stelvio Quadrifoglio’s eight-speed automatic gearbox has been tuned to shift gears in 150 milliseconds in its Race mode. The driver can also shift gears using steering column mounted aluminum paddles. There are four selectable drive modes: Dynamic, Natural, running-cost-friendly Advanced Efficiency and performance-orientated Race. 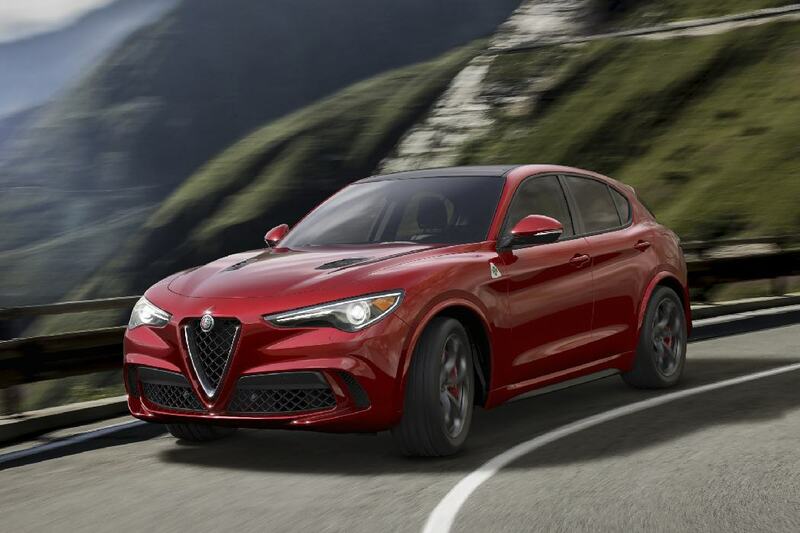 The Stelvio Quadrifoglio also gets optional carbon-ceramic brakes and Alfa’s Integrated Brake System, which is claimed to reduce stopping distances by combining a stability control system with the brake servo. The suspension comprises double wishbones at the front and a four-and-a-half-link set-up at the rear. Adjustable dampers also feature. Bigland has predicted that the Stelvio will become Alfa’s best-selling model, overtaking the Giulia saloon. Elsewhere in the Stelvio range, there will be a 2.0-litre petrol engine with 276bhp and 295lb ft. Bigland confirmed this engine would be capable of taking the SUV from zero to 60mph in 5.4sec. This implies that the Stelvio will get a warmperformance Veloce variant to sit below the Quadrifoglio, because the same engine is also used in the Giulia Veloce. Alfa Romeo hasn’t confirmed any other engines, but a source revealed that the existing 2.0-litre petrol and 2.2-litre diesel engines from the Giulia will complete the range. The 2.0-litre petrol unit makes 197bhp and 243lb ft in the Giulia, while the 2.2 diesel comes in 148bhp and 178bhp forms, both producing 332lb ft.
Three trim levels have been confirmed but not yet named. In the US, the car will also be available in a fourth specification, called Ti, which comes with 19in alloys and an 8.8in infotainment screen in place of the standard 6.5in unit. There’s also wood trim inside and Sport and Lusso packages will be offered. Across the range in the US at least Alfa’s Q4 four-wheel drive system will be fitted as standard. The Stelvio was developed in Alfa Romeo’s Modena engineering facility and will be built in Italy alongside the Giulia in the Cassino plant. The Stelvio is one of the more compact premium mid-sized SUVs, at 4686mm long, 1677mm tall (including antenna) and 1903mm wide (2163mm with mirrors). By comparison, the Macan Turbo is marginally longer, squatter and wider, at 4699mm long, 1624mm tall and 1923mm wide. Alfa claims a perfect 50/50 weight distribution has been achieved for the Quadrifoglio model, partly thanks to its use of carbonfibre on the driveshaft and the same material across the bodywork and many components. Alfa Romeo has yet to reveal the car’s kerb weight. The Quadrifoglio model is marked out by bodywork upgrades that include carbonfibre-detailed side skirts, more aggressive bumpers and wider wheel arches. Atop the bootlid sits a rear spoiler, which, Alfa says, is aerodynamically beneficial rather than merely aesthetic. There are also intercooler vents at the front that are specific to the Quadrifoglio. The Stelvio Quadrifoglio is expected to top the range at around 65,000$ and the standard car is likely to cost from around 40,000$. The Quadrifoglio is expected to reach dealers next summer. The 276bhp 2.0-litre Stelvio will go on sale before it the opposite of the approach taken with the Giulia. It’s thought that the Stelvio will be available with a manual gearbox in lower-spec versions, although this is unconfirmed.